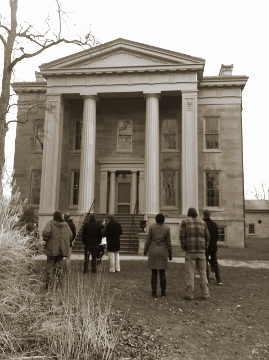 Today our class went on a field trip to Ruthven Park, in Cayuga, Ontario. Ruthven is a large country estate built between 1845 – 1847 for the Thompson family. It’s largely believed that it was constructed by the same master builder as Willowbank, John Latshaw. However, there are no records from the building of Ruthven to confirm this – only later verbal accounts. In any case, the two mansions have much in common. 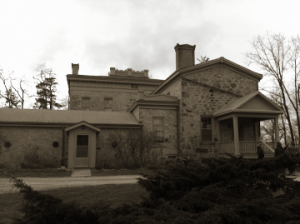 Unlike Willowbank (which changed ownership numerous times), Ruthven remained in the Thompson family for five generations; from its construction in 1845, right up until 1995. 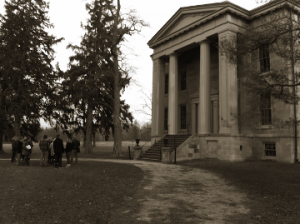 It is now a National Historic Site and a museum, operated by a land trust. 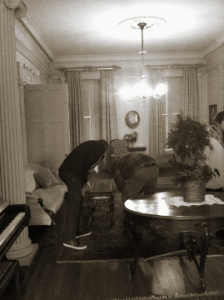 The mansion is maintained in it’s 1995 condition – exactly the way the family left it. 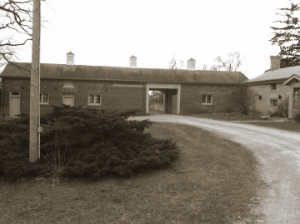 One thing I really liked about Ruthven, is the number of outbuildings that still exist. It really gave you the impression of a ‘country estate’ – or at least as I imagine them. Willowbank always appears a bit lonely to me, sitting all alone on top of a big hill. 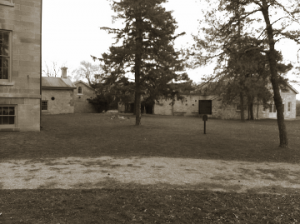 The complex of buildings at Ruthven adds something to the atmosphere of the place. Now, I don’t know if the two estates were both built by John Latshaw or not. I suppose someone more familiar with his work could find clues to help determine that. But if he did, then either the Thompsons had far more money to spend on their house than the Hamiltons did – or Latshaw really upped his game with Ruthven! The interior is stunning. I have a fairly vivid imagination, but have a hard time picturing Willowbank looking quite as good as this. Perhaps that’s not fair to Willowbank. I’m sure it was very grand in its day. 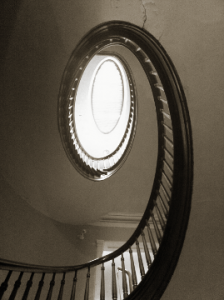 But when you see that spiral staircase at Ruthven, going all the way up to what would be the attic at Willowbank – and then having that skylight – its fantastic! 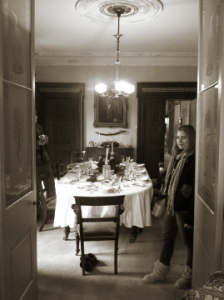 I will have to go back to Ruthven at some point, when I have more time, to explore the house in more detail. I’ll also have to take a better camera. The camera on the iPhone isn’t bad, but its not stellar. I found a lot of very interesting things during our tour… I happen to have a bit of a military background (I was an officer in the reserves); and the Thompson family were prominent in the local Militia. The museum holds a wonderful collection of the their military ‘stuff’. I was very interested in their collection of WWI artifacts. One of the most surprising things I saw in the house, was a set of Colours. 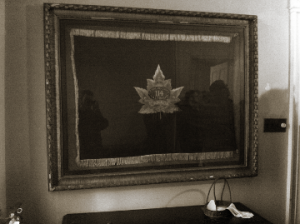 The Regimental Colours (shown in the photo) was framed, and on the wall to one side of the formal front entry. There is apparently also the matching King’s Colours – however it was out for some conservation work. For those who may not have a military background, Colours are extremely important flags, which are presented to a military unit by the Monarch. When they are retired from service, they are usually ‘deposited’ or ‘laid-up’ in a church or court house. It is almost unheard of for them to be given to a senior officer for his personal collection. It would have been an extraordinary honour, and a sign of the utmost respect by the soldiers of the Regiment. 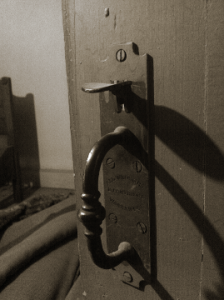 As a blacksmith, I also enjoyed looking at the wide array of metalwork in this beautiful old house. Again, a return visit is in order at some point, so that I can catalog some of it. This entry was posted on Monday, January 21st, 2013 at 10:03 pm	and is filed under Student Life, Tidbits. You can follow any responses to this entry through the RSS 2.0 feed. You can leave a response, or trackback from your own site.